George Orwell’s dystopian classic 1984 occupied the number one spot on Amazon’s best-selling books list yesterday, where it remains today. A cautionary tale about a brutal, amoral dictator has evidently felt relevant to people lately. But as of today, Amazon—the world’s largest bookseller—is unable to keep up with demand. 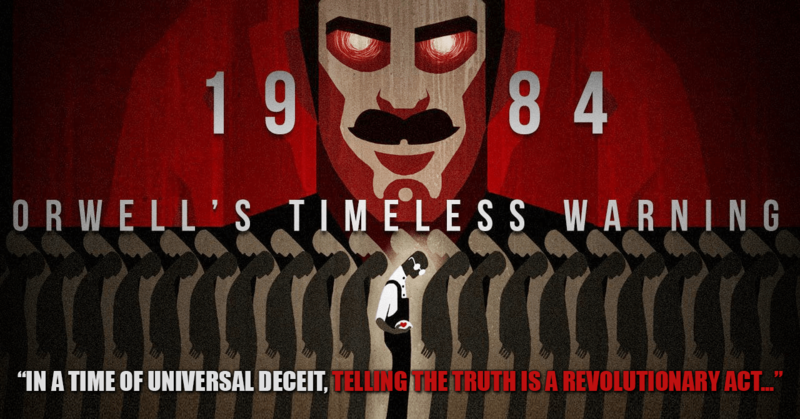 Currently 1984 is printed by Signet Classics, and both the hardcover and softcover versions are listed as “temporarily out of stock.” As CNN reported yesterday, Penguin (the parent company of the New American Library, Signet’s parent company) is racing to print more copies of Orwell’s novel. Under the Trump administration, quotes like, “The object of torture is torture” and, “If you want a picture of the future, imagine a boot stamping on a human face—for ever” must be resonating with people. Go figure. Digital editions aren’t consumable so anyone seeking to reread a piece of their middle school curriculum can easily do so on an e-reader or use Amazon to purchase used and out-of-print copies through third party sellers. Realistically, this isn’t a big deal and copies will surely be back in stock soon for those of us who prefer our speculative fiction on dead trees. It’s still bonkers to think Amazon would manage to completely sell out of a classic, mass-market book this widely read. We’ve reached out to George Orwell to see why he thinks his book is suddenly experiencing a surge of popularity. Orwell has been dead for over 60 years, but we’ll update if we hear back. Until then it’s anyone’s best guess. Update 1/28/17 5:40pm EST: Amazon now lists the mass market paperback version as being in stock starting February 3rd.